Decision trees are the fundamental building block of gradient boosting machines and Random Forests™, probably the two most popular machine learning models for structured data. Visualizing decision trees is a tremendous aid when learning how these models work and when interpreting models. Unfortunately, current visualization packages are rudimentary and not immediately helpful to the novice. For example, we couldn't find a library that visualizes how decision nodes split up the feature space. It is also uncommon for libraries to support visualizing a specific feature vector as it weaves down through a tree's decision nodes; we could only find one image showing this. Each leaf in the decision tree is responsible for making a specific prediction. 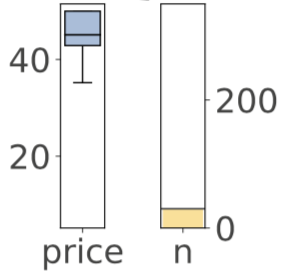 For regression trees, the prediction is a value, such as price. For classifier trees, the prediction is a target category (represented as an integer in scikit), such as cancer or not-cancer. A decision tree carves up the feature space into groups of observations that share similar target values and each leaf represents one of these groups. For regression, similarity in a leaf means a low variance among target values and, for classification, it means that most or all targets are of a single class. To train a decision node, the model examines a subset of the training observations (or the full training set at the root). The node's feature and split point within that feature space are chosen during training to split the observations into left and right buckets (subsets) to maximize similarity as defined above. (This selection process is generally done through exhaustive comparison of features and feature values.) The left bucket has observations whose xi feature values are all less than the split point and the right bucket has observations whose xi is greater than the split point. Tree construction proceeds recursively by creating decision nodes for the left bucket and the right bucket. Construction stops when some stopping criterion is reached, such as having less than five observations in the node. Decision tree visualizations should highlight the following important elements, which we demonstrate below. Decision node feature versus target value distributions (which we call feature-target space in this article). We want to know how separable the target values are based upon the feature and a split point. Decision node feature name and feature split value. We need to know which feature each decision node is testing and where in that space the nodes splits the observations. Leaf node purity, which affects our prediction confidence. Leaves with low variance among the target values (regression) or an overwhelming majority target class (classification) are much more reliable predictors. Leaf node prediction value. What is this leaf actually predicting from the collection of target values? Numbers of samples in decision nodes. Sometimes it's useful to know where all most of the samples are being routed through the decision nodes. Numbers of samples in leaf nodes. Our goal is a decision tree with fewer, larger and purer leaves. Nodes with too few samples are possible indications of overfitting. How a specific feature vector is run down the tree to a leaf. This helps explain why a particular feature vector gets the prediction it does. For example, in a regression tree predicting apartment rent prices, we might find a feature vector routed into a high predicted price leaf because of a decision node that checks for more than three bedrooms. Before digging into the previous state-of-the-art visualizations, we'd like to give a little spoiler to show what's possible. 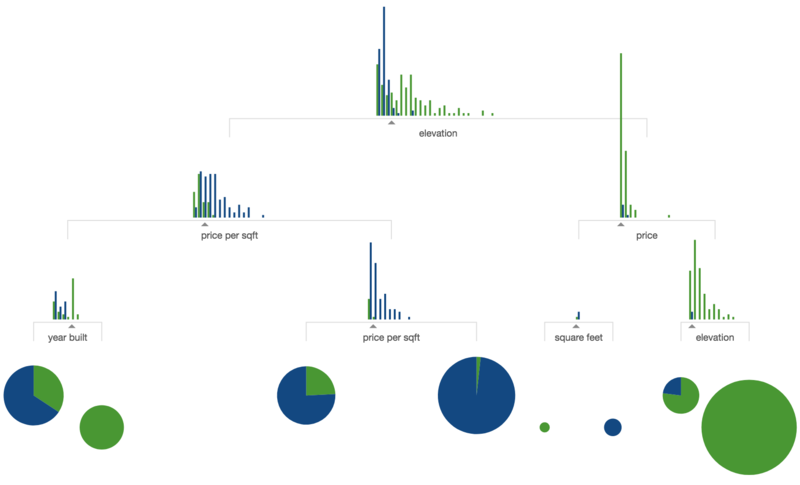 This section highlights some samples visualizations we built from scikit regression and classification decision trees on a few data sets. You can also check out the	full gallery and code to generate all samples. 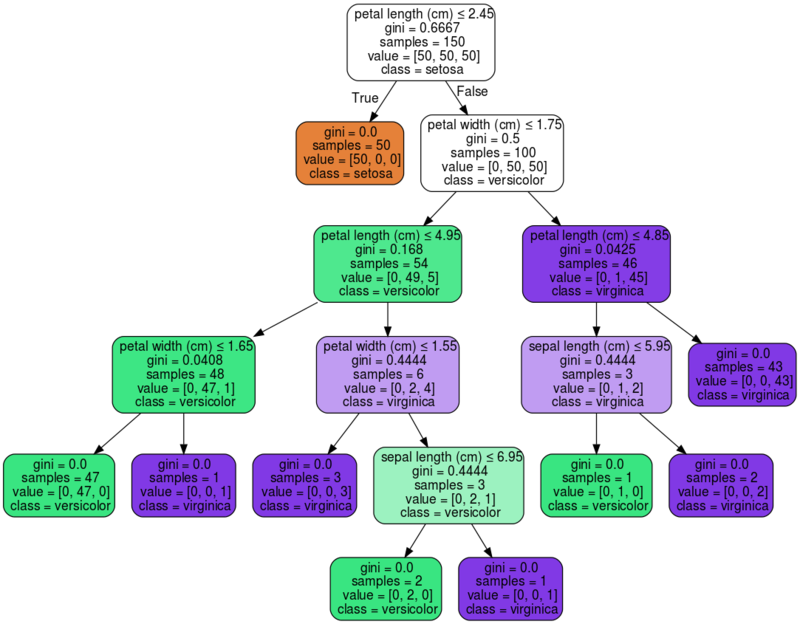 If you search for “visualizing decision trees” you will quickly find a Python solution provided by the awesome scikit folks: sklearn.tree.export_graphviz. With more work, you can find visualizations for R and even SAS and IBM. 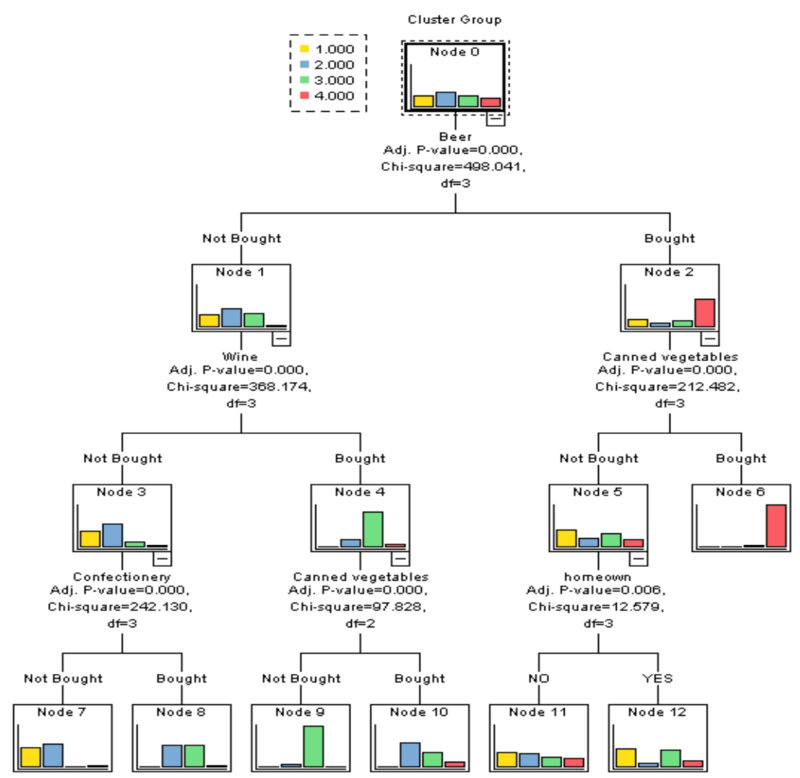 In this section, we collect the various decision tree visualizations we could find and compare them to the visualizations made by our dtreeviz library. We give a more detailed discussion of our visualizations in the next section. 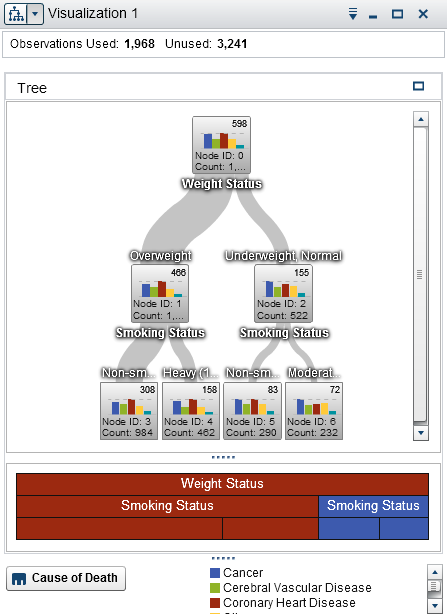 Let's start with the default scitkit visualization of a decision tree on the well-known Iris data set (click on images to enlarge). The scikit tree does a good job of representing the tree structure, but we have a few quibbles. The colors aren't the best and it's not immediately obvious why some of the nodes are colored and some aren't. If the colors represent predicted class for this classifier, one would think just the leaves would be colored because only leaves have predictions. (It turns out the non-colored nodes have no majority prediction.) Including the gini coefficient (certainty score) costs space and doesn't help with interpretation. The count of samples of the various target classes in each node is somewhat useful, but a histogram would be even better. A target class color legend would be nice. Finally, using true and false as the edge labels isn't as clear as, say, labels and . The most obvious difference is that our decision nodes show feature distributions as overlapping stacked-histograms, one histogram per target class. Also, our leaf size is proportional to the number of samples in that leaf. In the scikit tree, it's not immediately clear what the use of color implies, but after studying the image, darker images indicate higher predicted target values. As before, our decision nodes show the feature space distribution, this time using a feature versus target value scatterplot. The leaves use strip plots to show the target value distribution; leaves with more dots naturally have a higher number of samples. Indicating the size of the left and right buckets via edge width is a nice touch. But, those bar charts are hard to interpret because they have no horizontal axis. 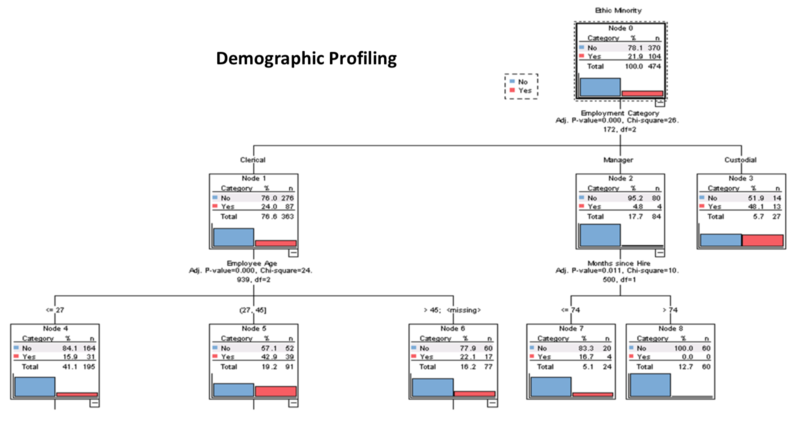 Decision nodes testing categorical variables (left image) have exactly one bar per category, so they must represent simple category counts, rather than feature distributions. For numeric features (right image), SAS decision nodes show a histogram of either target or feature space (we can't tell from the image). SAS node bar charts / histograms appear to illustrate just target values, which tells us nothing about how the feature space was split. 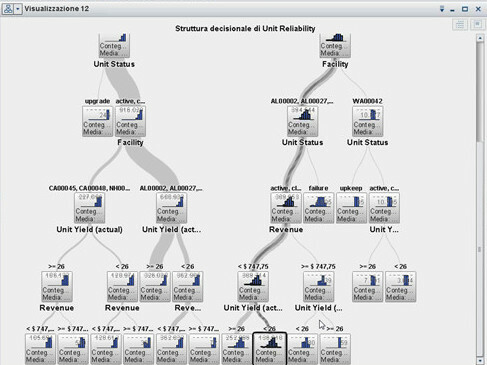 The SAS tree on the right appears to highlight a path through the decision tree for a specific unknown feature vector, but we couldn't find any other examples from other tools and libraries. The ability to visualize a specific vector run down the tree does not seem to be generally available. These SPSS decision nodes seem to give the same SAS-like bar chart of sample target class counts. While that visualization is a hardcoded animation for educational purposes, it points in the right direction. 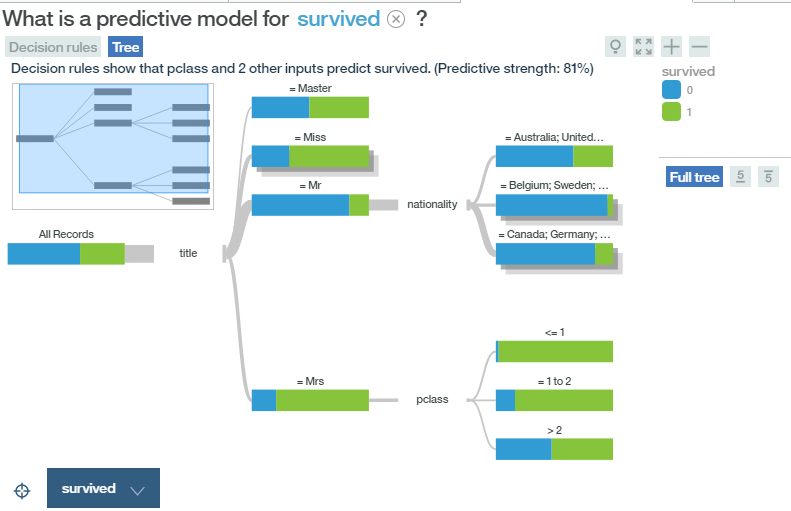 Other than the educational animation in A visual introduction to machine learning, we couldn't find a decision tree visualization package that illustrates how the feature space is split up at decision nodes (feature-target space). 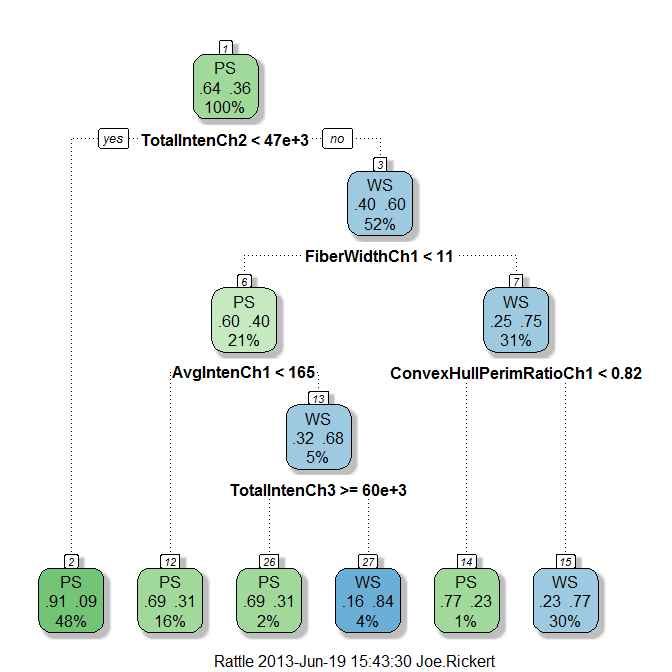 This is the critical operation performed during decision tree model training and is what newcomers should focus on, so we'll start by examining decision node visualizations for both classification and regression trees. Horizontal dashed lines indicate the target mean for the left and right buckets in decision nodes; a vertical dashed line indicates the split point in feature space. The black wedge highlights the split point and identifies the exact split value. Leaf nodes indicate the target prediction (mean) with a dashed line. As you can see, each AGE feature axis uses the same range, rather than zooming in, to make it easier to compare decision nodes. As we descend through decision nodes, the sample AGE values are boxed into narrower and narrower regions. For example, the AGE feature space in node 0 is split into the regions of AGE future space shown in nodes 1 and 8. Node 1's space is then split into the chunks shown in nodes 2 and 5. The prediction leaves are not very pure because training a model on just a single variable leads to a poor model, but this restricted example demonstrates how decision trees carve up feature space. Ignoring color, the histogram shows the PEG feature space distribution. Adding color gives us an indication of the relationship between feature space and target class. For example, in node 0 we can see that samples with very_low target class are clustered at the low end of PEG feature space and samples with High target class are clustered at the high-end. As with the regressor, the feature space of a left child is everything to the left of the parent's split point in the same feature space; similarly for the right child. For example, combining the histograms of nodes 9 and 12 yields the histogram of node 8. We force the horizontal axis range to be the same for all PEG decision nodes so that decision nodes lower in the tree clearly box in narrower regions that are more and more pure. We use a stacked histogram so that overlap is clear in the feature space between samples with different target classes. Note that the height in the Y axis of the stacked histogram is the total number of samples from all classes; multiple class counts are stacked on top of each other. Thus far we've skipped over many of the visual cues and details that we obsessed over during construction of the library and so we hit the key elements here. 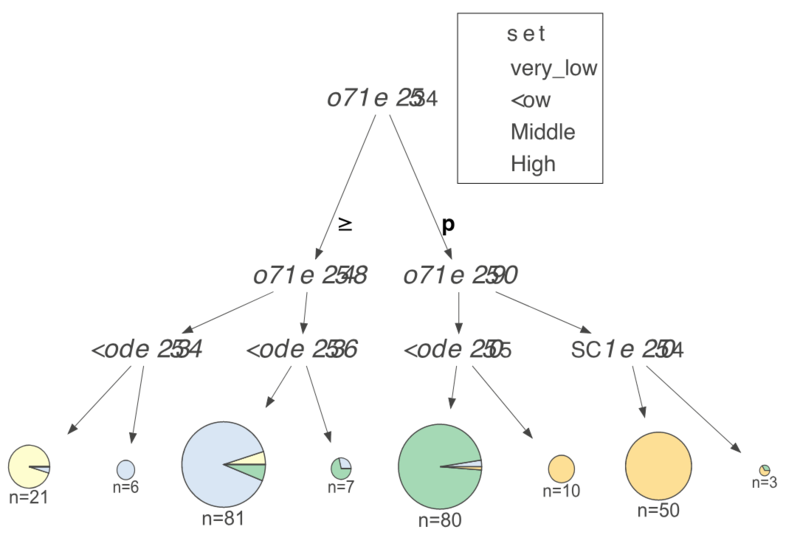 Our classifier tree visualizations use node size to give visual cues about the number of samples associated with each node. Histograms get proportionally shorter as the number of samples in the node decrease and leaf node diameters get smaller. The feature space (horizontal axis) is always the same width and the same range for a given feature, which makes it much easier to compare the feature-target spaces of different nodes. The bars of all histograms are the same width in pixels. We use just the start/stop range labels for both horizontal and vertical axes to reduce clutter. We use a pie chart for classifier leaves, despite their bad reputation. For the purpose of indicating purity, the viewer only needs an indication of whether there is a single strong majority category. The viewer does not need to see the exact relationship between elements of the pie chart, which is one key area where pie charts fail. The color of the pie chart majority slice gives the leaf prediction. Turning to regressor trees now, we make sure that the target (vertical) axis of all decision nodes is the same height and the same range to make comparing nodes easier. Regressor feature space (horizontal axis) is always the same width and the same range for a given feature. We set a low alpha for all scatterplot dots so that increased target value density corresponds to darker color. Regressor leaves also show the same range vertically for the target space. 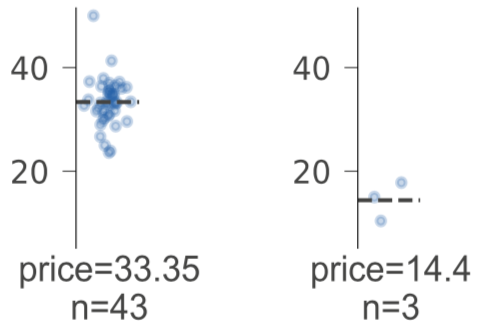 We use a strip plot rather than, say, a box plot, because the strip plot shows the distribution explicitly while implicitly showing the number of samples by the number of dots. (We also write out the number of samples in text for leaves.) The leaf prediction is the distribution center of mass (mean) of the strip plot, which we highlight with a dashed line. To figure out how model training arrives at a specific tree, all of the action is in the feature-space splits of the decision nodes, which we just discussed. Now, let's take a look at visualizing how a specific feature vector yields a specific prediction. The key here is to examine the decisions taken along the path from the root to the leaf predictor node. The test vector x with feature names and values appears below the leaf predictor node (or to the right in left-to-right orientation). The test vector highlights the features used in one or more decision nodes. When the number of features reaches a threshold of 20 (10 for left-to-right orientation), test vectors do not show unused features to avoid unwieldly test vectors. These look really cool but, in the end, histograms are easier to read. That is misleading because the horizontal axis is usually feature space. We scrunched that into a strip plot. This section gives a sample visualization for the Boston regression data set and the Wine classification data set. You can also check out the	full gallery of sample visualizations and the code to generate the samples. In Jupyter notebooks, the object returned from dtreeviz() has a _repr_svg_() function that Jupyter uses to display the object automatically. See notebook of examples. The good news is that github displays them properly as does JupyterLab. Use Image(viz.topng()) to display (poorly) in Juypter notebook or simply call viz.view(), which will pop up a window that displays things properly. This project was very frustrating with lots of programming deadends, fiddling with parameters, working around bugs/limitations in tools and libraries, and creatively mashing up a bunch of existing tools. The only fun part was the (countless) sequence of experiments in visual design. We pushed through because it seemed likely that the machine learning community would find these visualization as useful as we will. This project represents about two months of trudging through stackoverflow, documentation, and hideous graphics programming. At the highest level, we used matplotlib to generate images for decision and leaf nodes and combined them into a tree using the venerable graphviz. We also used HTML labels extensively in the graphviz tree description for layout and font specification purposes. The single biggest headache was convincing all components of our solution to produce high-quality vector graphics. 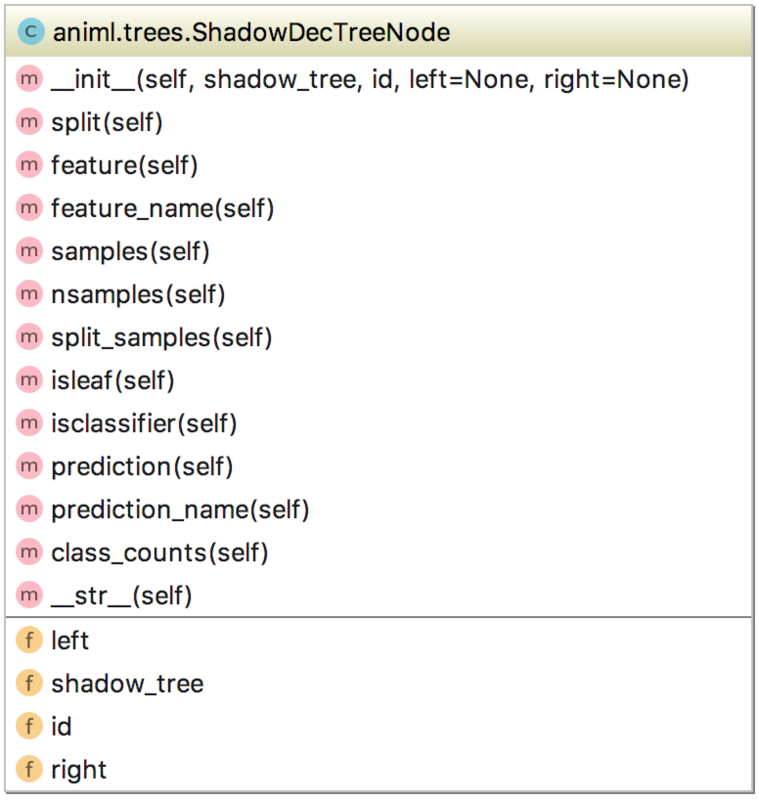 Our initial coding experiments led us to create a shadow tree wrapping the decision trees created by scikit, so let's start with that. 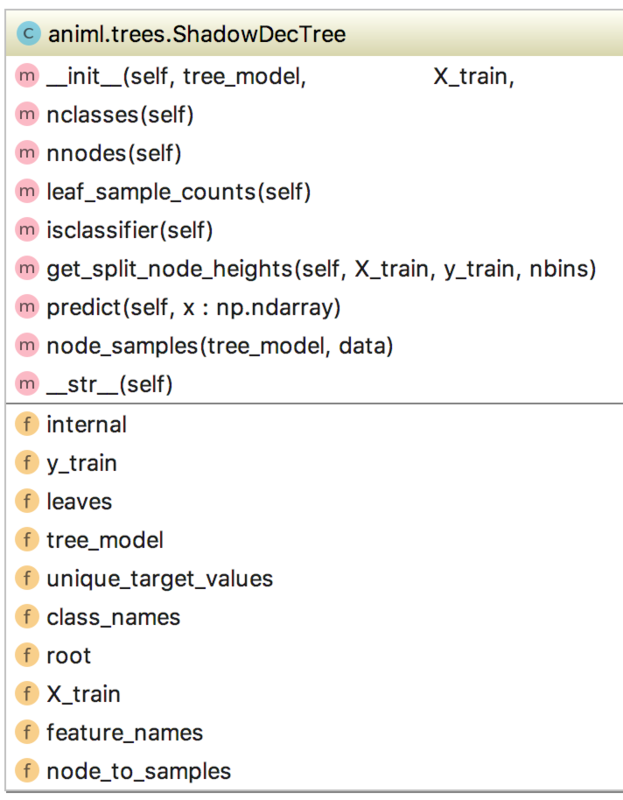 The shadow tree/node classes have a lot of methods that could be useful to other libraries and tools that need to walk scikit decision trees. For example, predict() not only runs a feature vector through the tree but also returns the path of visited nodes. The samples associated with any particular node can be had through node_samples(). We also use the run() function to execute the pdf2svg (PDF to SVG conversion) tool, as described in the next section. The 94806 number is the process ID, which helps isolate multiple instances of dtreeviz running on the same machine. Without this, it's possible for multiple processes to overwrite the same temporary files. Originally, when we resorted to generating PNG files from matplotlib, we set the dots per inch (dpi) to be 450 so that they looked okay on high resolution screens like the iMac. Unfortunately, that meant we had to specify the actual size we wanted for the overall tree using an HTML table in graphviz using width and height parameters on <td> tags. That cause a lot of trouble because we had to figure out what the aspect ratio was coming out of matplotlib. Once we moved to SVG files, we unnecessarily parsed the SVG files to get the size for use in the HTML; as we wrote this document we realized extracting the size information from SVG files was unnecessary. Unfortunately, graphviz's SVG output simply referenced the node files that we imported, rather than embedding the node images within the overall tree image. This is a very inconvenient form because sending a single tree visualization means sending a zip of files rather than a single file. We spent the time to parse SVG XML and embed all referenced images within a single large meta-SVG file. That worked great and there was much celebration. Then we noticed that graphviz does not properly handle text in HTML labels when generating SVG. For example, the text of classifier tree legends was cut off and overlapping. Rats. What finally worked to get a single clean SVG file was first generating a PDF file from graphviz and then converting the PDF to SVG with pdf2svg (pdf2cairo also appears to work). Then we noticed that Jupyter notebook has a bug where it does not display those SVG files properly (see above). Jupyter lab does handle the SVG properly as does github. We added a topng() method so users of Jupyter notebook can use Image(viz.topng()) to get inline images. Better yet, call viz.view(), which will pop up a window that displays images properly. Sometimes solving a programming problem is less about algorithms and more about working within the constraints and capabilities of the programming ecosystem, such as tools and libraries. That is definitely the case with this decision tree visualization software. The programming was not hard; it was more a matter of fearlessly bashing our way to victory through an appropriate mashup of graphics tools and libraries. Designing the actual visualization also required a seemingly infinite number of experiments and tweaks. Generating high quality vector-based images also required pathological determination and a trail of dead code left along the circuitous path to success. We are definitely not visualization aficionados, but for this specific problem we banged on it until we got effective diagrams. In Edward Tufte's seminar I learned that you can pack a lot of information into a rich diagram, as long as it's not an arbitrary mishmash; the human eye can resolve lots of details. We used a number of elements from the design palette to visualize decision trees: color, line thickness, line style, different kinds of plots, size (area, length, graph height, ...), color transparency (alpha), text styles (color, font, bold, italics, size), graph annotations, and visual flow. All visual elements had to be motivated. For example, we didn't use color just because colors are nice. We used color to highlight an important dimension (target category) because humans quickly and easily pick out color differences. Node size differences should also be easily picked out by humans. (is that a kitty cat or lion? ), so we used that to indicate leaf size. The visualizations described in this document are part of the dtreeviz machine learning library, which is just getting started. We'll likely moved the rfpimp permutation importance library into dtreeviz soon. At this point, we haven't tested the visualizations on anything but OS X. We'd welcome instructions from programmers on other platforms so that we could include those installation steps in the documentation. There are a couple of tweaks we like to do, such as bottom justifying the histograms and classifier trees so that it's easier to compare notes. Also, some of the wedge labels overlap with the axis labels. Finally, it would be interesting to see what the trees look like with incoming edge thicknesses proportional to the number of samples in that node.